← Delicata Squash: A Small Winter Wonder. Cathead Biscuits: A Dying Breed. Cathead Biscuits are a southern staple. But due to the advent of canned biscuit dough (and more recently frozen biscuit dough.) The original “quick biscuits” are all-too-quickly becoming only a memory. I’m very sure that if you asked most southerners what a biscuit looked like 20 years ago, they would respond by explaining to you that there were two different types: Pan biscuits and cathead biscuits. Pan biscuits are what most people think of when you reference biscuits. The round, crisp bottomed, soft topped buttered delights. But, there’s a drawback to pan biscuits: kneading, rolling and cutting. Pan biscuits were made when you could spend time developing those precious glutens that give pan biscuits that wonderful pillow texture. 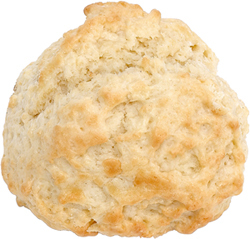 But for everyday use, the southern standard was a cathead biscuit. Spooned up from the mixing bowl, rolled into a ball and plopped on a greased pan. These crunchy on the outside, soft on the inside, delights had a marvelous orange/white/brown speckled hue, and had a taste reminiscent of floury scones (which makes sense, seeing as they are both “quick breads”) Cathead biscuits were served as the ubiquitous accompaniment to any meal because of their unique ability to be suited just as well for “slathering” (being covered in butter, jelly, or honey) or “sopping” (soaking up whatever gravy or sauce is on the plate.) In fairness to pan biscuits, you can sop, and slather them. But sopping with a crispy edged cathead biscuit is a much more rewarding process, since the biscuit is strong enough to double as a utensil, holding much more than just sauce. I’ve seen people eat entire meals only using a biscuit as a conveyance method between plate and mouth. And for the southerner afraid of wasting any of the remaining morsels on the plate, one could make a “mash.” Which means, quite literally, to mash your biscuit into whatever remains on the plate, picking it up like a magnet so there’s nothing lost. So dear reader, I leave you with a simple recipe, and ask that you take the time to keep tradition alive. Because the results are much more rewarding than that frozen, mass-produced, brick, lying in wait deep within your freezer. Preheat the oven to 450. Mix the flour and sugar in a sizeable bowl, then cut in the shortening until it resembles a coarse meal. Pour the buttermilk in, a little at a time, until you’ve made a sticky dough. Lightly grease a sheet pan, and lightly dust your hands with flour. Pinch off a palm sized piece of dough, and roll it in your hands until it forms a ball. Place it in a non-stick cookie sheet and arrange the pan as symmetrically as possible to even the baking process. Brush the tops with melted butter, and bake for 10-12 minutes, or until brown. This entry was posted in Cuisine, Culture, Recipe and tagged Baking, Biscuit, Food, Recipe, Southern, Southern Food, Tradition. Bookmark the permalink. I may have missed it, but where do you use the buttermilk? I say the same thing. I hate incomplete recipes! Cat headed biscuits. My mother in law makes these, being from the north I called these drop biscuits. My iPad did’t leave out the buttermilk instructions. It was added after the crisco was incorporated. Why use self-rising flour? Why not make it in a true Southern fashion making it with baking powder & salt! It was not patented until 1845. Your true Southern cook would have all the ingredients necessary.